Interested in bringing Reusables to your community? 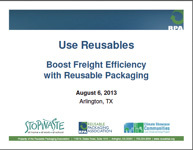 The Use Reusables team has collaborated with public agencies and non-profits in California and beyond to hold workshops and support other efforts to replace limited use transport packaging with reusable alternatives. If your organization is interested in promoting Reusables, we'd be happy to share tools, advice and experiences. Please contact us!